We love watching Jenna Rainey create beautiful flowers and are excited everytime we see her tag us on Instagram. Her work inspires and educates watercolor painters around the globe and we are excited to share this tutorial with you. 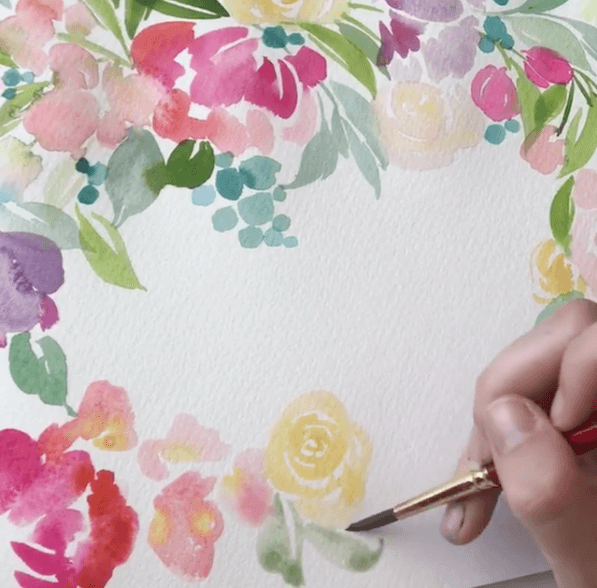 Jenna is often asked how she creates full, loose floral pieces when she paints. She shared a tutorial video showcasing her techniques and offers tips along the way, including two key areas involved in the creation of an intricate work of art. “Every time I sit down to paint a piece like this, I think about two things first: color palette and shapes. This particular palette involves every color of the rainbow: ROYGBIV. Always keep an eye out for where your color is landing. Are there clusters of the same color in one spot? Do you always have contrasting colors (example: purple and yellow) sitting next to each other? You want to create bounce for your eyes, so make sure to switch it up and place these elements around your piece in a zig-zag fashion! This way, your eyes won’t be directed in a straight line (if you have a bunch of yellows stacked on each other to form a line, etc), or be held in one specific area for too long. Watch her tutorial video below.